NFIP National Flood Insurance program is run by the federal government and available in addition to your standard property insurance. 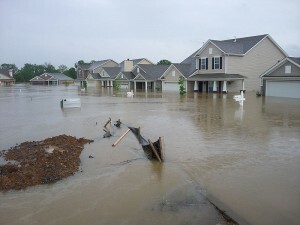 It covers only flood damage and is available in communities that participate in the National Flood Insurance Program. Floods cause a lot of damage. There are very few small claims as just a few inches can result in tens of thousands of dollars. Floors, wallboard, insulation, and wiring need to be ripped out and replaced. It is reported that the annual damage from floods exceeds the damage from fires. Depending on where you live, you may be required to buy and maintain flood insurance as a condition of your mortgage loan. It’s available through most insurance brokers or from direct insurers. More information is available at 1-888-RAIN924 (1-888-724-6924) or at www.floodsmart.gov. Flood insurance covers the type of water damage that occurs when the water level in your neighborhood rises and water flows in. It doesn’t cover other water damage like leaks or if your roof blows off and rain comes in. It also won’t cover basements, crawl spaces, or any areas below the ground level. Your standard homeowners insurance might cover those situations. Topographic maps are used to determine flood plains or areas that are prone to flooding. If your home is in one of these areas, you should consider flood insurance. Many mortgage providers, especially if they are government backed like FHA and VA will require it. These maps are updated every few years. Rates are based on many factors including your construction type, relative risk, value, and local government programs. There is a quick search tool available at floodsmart.gov that will rate your risk and give a ballpark estimate of cost. Exact rates usually require an inspection. Like homeowners insurance, you will probably have a choice between purchasing Actual Cash Value insurance (paying for the depreciated value of the loss) or Replacement Cash Value insurance (paying for the replacement cost). Some people confuse flood insurance with disaster relief. Flood insurance is reimbursement for your loss based on insurance principles, disaster relief is a federal loan program based on political whim.